I finally placed an order with the locally-based and owned company Pure Play Kids. I'd been seeing the company's toys at my friends' houses and I was starting to get toy envy. We got these two felt playmats (Sea Life and Transportation, right) for an upcoming plane trip. Of course I'm bringing the iPad, since I'll be traveling with 2 kids by myself with a layover, but I'd like to last at least an hour- maybe two!! !- without technology. 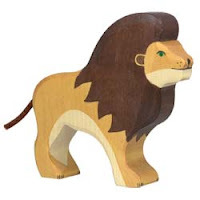 The wooden animals from Pure Play Kids are beautiful- my friend has several and they are large and sturdy. (I put them on my wish list.) This bus is also a great piece. Check out the very nice Facebook page with useful tips, links, and coupon codes! Pure Play Kids offers one of the largest selections of battery-free, TV-free, creative playthings in the USA. We have a sharp focus on creativity, safety and natural materials. So whether you seek wooden toys, cloth dolls, natural teethers, Waldorf toys or the perfect baby gift, Pure Play Kids has you covered. Additionally, Made in America toys are the bulk of our offering, and the remainder are fine European toys. Kid-powered is the term we use to describe our products. 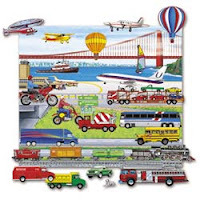 Let kids provide the motion, sounds, storyline and characters that drive the toys – not vice-versa – and witness a flourishing of imagination, confidence and skills. I also love that many of the pics on the site are taken in Stamford, like this one of the garden/beach set at Cove Beach!